Viewing topic "Using Arpeggio SF button in Song record"
When I am in Song mode wanting to use the programmed ARP SF buttons to lay down a drum track I’m finding that once I press record, I’m shut out from the Arp buttons. That is, the screen changes to the one with the SCN buttons. Whatever ARP I’ve got highlighted plays and records MIDI just fine to the selected track, but there’s no way to switch around measure by measure in realtime while recording. Since this process is described in detail in “Painting Arpeggios” and other articles, I’m wondering if there’s some setting I need to change. I presume it would work whether I’m in Song mode OR Pattern mode. I use Performance a lot “live” with pre-programmed drums that I switch in and out on the fly. It’s fun and works in some ways better then a Pattern, but there are some tunes I’d like to convert into linear Songs or Patterns. Is this easy enough to do, maybe even some shortcuts, considering that I’m having problems as described above? Maybe I’m missing something and hoping there’s an obvious solution. [...] When I am in Song mode wanting to use the programmed ARP SF buttons to lay down a drum track I’m finding that once I press record, I’m shut out from the Arp buttons. That is, the screen changes to the one with the SCN buttons. Whatever ARP I’ve got highlighted plays and records MIDI just fine to the selected track, but there’s no way to switch around measure by measure in realtime while recording. Since this process is described in detail in “Painting Arpeggios” and other articles, I’m wondering if there’s some setting I need to change. I presume it would work whether I’m in Song mode OR Pattern mode. As RHproducer mentioned, one approach is to use Direct Performance Record. You can ignore the part about Masters. That doesn’t sound like what’s described in the “Painting Drum Arpeggios” article. That’s whats throwing me. I read that article and sat down to do as described. Maybe it’s referring to another model and not MOXF? There are a few different ways to access the Arps in real time while recording. Methods described for the MOX also work for the MOXF. On my Motif XF, when in Record standby mode pressing [F2](Arpeggio) will bring up an Arp setup screen for the selected Track (1~16), and the SF buttons will allow Arp selection via that screen while recording. For the MOX or MOXF, I believe you need to press either ARP [EDIT] or [F3] ARP ED while in Record standby. That should allow real time Arp selection during recording. “In our next section we will discuss the differences you encounter when “painting” arpeggios to a linear SONG. It is quite clearly saying that, with almost no difference, the procedure should work in both Pattern and Song. On my MOXF when I press the Record (Standby till you hit Play) it takes me out of the view with the Arps and it will not let me see that again. If I hit any other buttons it either ignores or it says Please Stop Sequencer. [...] On my MOXF when I press the Record (Standby till you hit Play) it takes me out of the view with the Arps and it will not let me see that again. If I hit any other buttons it either ignores or it says Please Stop Sequencer. Does that not work on your MOXF? Thanks for getting into this with me. What you quoted there does NOT work on my MOXF. When I’m in armed for Record mode it offers me the F3 ARP ED and I can go there and play and assign freely (just like when I’m in Performance mode). When I touch Record button again (which is still armed/lit) it shows me the menu for Replace, Overdub, target Track, Start measure, etc. But only the Arp that I left engaged on the previous screen will sound. If I hit Play now it goes into full Record, but I can only use that Arp that is engaged and if I hit any other button to try to get back (while still recording) it essentially ignores and says “Please Turn Sequencer Off”. If I stop it shows me the F3 ARP ED, as before. So to be clear, yes, I’m able to use ONE of the Arps (the one that was engaged when I left that menu), but the articles describe something specific— Simply place your main drum grooves (arp Types) on the [SF] buttons and your fill-ins on other [SF] buttons and as the Song advances you can intuitively construct the drum track”. I am not able to “intuitively construct the drum track” or do so “… as the Song advances”. I experimented with a Piano ARP instead and the ARP responds to changes in the bass note and chord (as in Performance) but, again, it’s only that ARP. There is no changing ARPs mid record/mid Song. The language in the articles is SO specific about “painting” and “as Song advances” that I can’t help think that there is some parameter elsewhere that is gumming things up. I tried taking Voice with ARP on or off, but it makes no difference. The Switch is ON, Hold is ON. It’s set to change on the Measure. And, again, if I touch any other logical buttons (like EDIT next to the Arp On/Off button or the other Edit button by the 16 channel buttons) it says, “Stop Sequencer”. Thanks for getting into this with me. What happens if you don’t press Record at that point, but you press the Play button instead? If the RECORD is lit it goes into Record. If not it just ignores me. From the general SONG I can go into the ARP Edit menu whether the Record button is on (lit) or off. I hit the physical ARP EDIT button next the to ARP ON/OFF button and it offers me the six ARP assignments. In that scenario at this point I have not touched the RECORD button, but it still (cruelly, if you think about it) allows me to tweak ARPS 1-6 to my hearts content. As for the question of which model and version is being described, it was my impression the article was written in relation to the “old” MOX sequencer, so it seems unlikely that feature would be different in the improved model. Which leaves only a couple explanations—my keyboard has some glitch, the article is describing something that can only be done with one of the fancier models and I am spinning my wheels, or there is some other parameter that needs to be set that is somehow not mentioned in the article. The situation seems strange. The article definitely doesn’t describe a “fancier” model, because [F3] ARP ED exists only on the MOX and MOXF. I have an XS and XF, and the screens and button presses for what we’re discussing are too different for this to be a mix-up of that sort. It begs the question of why [F3] ARP ED exists in Record mode if not for what you’re attempting to do, since it would seem that ARP [EDIT] would serve the purpose in other modes. I’m running out of ideas. I haven’t found anything to indicate an OS bug, but I wonder if there’s an operational difference between OS versions. Which OS is installed on your MOXF? Read the displayed firmware (Firm:). Yes, it is certainly strange. Sure hope it IS the OS, since it’s clearly an aberration. I have 1.10.2 and I’m pretty sure it’s obsolete. Where would I find and download the authorized version of the latest OS? Any tips for loading it would be appreciated. See the Readme file that comes with the download. Make a backup “All” file. Use a USB flash drive known to work reliably with your MOXF, and copy the 8L26OS_.PGM file to the root of the drive (not in a folder). 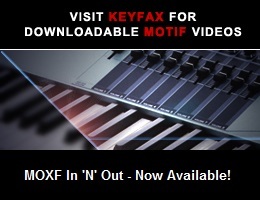 Hopefully other MOXF users will let us know if they’re aware of a way to select Arps while recording in Song mode. If there are no other comments from Motifator members, I suggest that you contact Yamaha Support - contact information is on the last page of the Owner’s Manual. I have the new OS and will install it tomorrow. I read the text/PDF and it’s mostly clear. However, I did this once before on my early MOX8 and I recall having some concerns about User Arpeggios being lost and also having to reload Dave Polich’s Vintage Keys and B’s Knees sounds back into the User 1 or User 2. I have the Flash Memory installed, but have never used it or any other samples. Is saving an ALL file the most I can do to preserve things? Or at least make sure I have a way to reinstall things. I am also going to make a Factory ALL file before loading back any of my working ALL files. Fingers crossed, something good will happen with the new OS. The “All” file will capture USER 1, USER 2, User Arps, and any other User data. As long as you save the file beforehand, and reload it as directed in the Readme after completing the OS update, there shouldn’t be a problem. I hope it makes a difference, but if not do contact Yamaha Support. They should know what can, and can’t, be done on the MOXF. Worst case, the previous methods mentioned in this thread will allow you to switch Arps while recording. I have version 1.12 installed on my MOXF8 and the behaviour is just as you described, where you see the “SCENE” buttons instead of the “ARP” buttons - in SONG mode. In PATTERN mode you do see the ARP buttons. I hadn’t noticed it before, because I always “paint” the arps to patterns first, and creating a pattern chain before converting it to a linear song. But if I wanted to immediately create a linear song, it would be very annoying so I can understand your frustration! What are the SCENES even for anyway (have had the MOXF for a year and still haven’t explored everything). So, I don’t think it’s your MOXF. It seems to be a “feature”. Have you tried posting on YamahaSynth to see what bad mister has to say about it?